So, if you are still with me on this concept (and I promise that with the next post there will be more screen captures and how-to tips on setting up your own wiki), I finally made a choice. - many if not most of my readers of my other blogs and members of the genea-blogger community are familiar with Wikipedia in terms of the look and feel. There is much to be said about the ease of use in terms of looking up items and browsing from link to link. - MediaWiki is free and open-source. This is important to me in terms of keeping costs down and having an environment that encourages developers to create extensions (MediaWiki's form of widgets since its back-end coding language is PHP). Many of the other platforms do not have the library of exntensions available for me to build the wiki of my dreams. 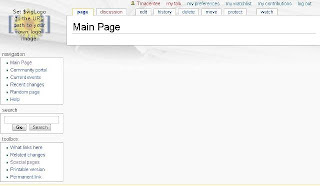 - while MediaWiki is not WYSIWIG and is not terribly user-friendly for someone who wants to add or edit content, by using the Semantic Forms extension, I can create templates and forms which will make the process much easier and standardize data entry tasks. - I am currently using two different hosts - SiteGround and GoDaddy - for my various wikis. Lowville Long Ago uses SiteGround and at some point I will migrate it over to GoDaddy which hosts my thomas 2.0 and BigLaw 2.0 sites and blogs. When I first pursued this wiki concept, GoDaddy did not have the proper hosting tools in place for MediaWiki. So once I placed my order and selected a domain name, the hosting site actually took care of installing MediaWiki for me. This is not only a big time saver but it takes much of the stress away from making sure all the back-end databases and tools are in place. Basically what I got was an "off the shelf" version of MediaWiki just waiting for me to customize it. What is Lowville Long Ago? Lowville Long Ago by Thomas MacEntee is licensed under a Creative Commons Attribution-Noncommercial-Share Alike 3.0 United States License. 1. Copyright: This blog and its contents are copyrighted 2008 by Thomas MacEntee. It's mine, all mine. 2. Content: I am responsible for the content of this blog which reflects my personal views and opinions, not those of anyone else or any of my current or past employers. Think of this as a personal journal or diary upon which you have stumbled. You may see things you like and things you don’t. Either way it is my right to state them. 3. Credit: Besides giving credit to my Creator, my mother, my partner and all those who’ve influenced me, I strive to give proper credit to any sources of content or information in this blog. If you feel you or another source lacks credit, please let me know. No one likes a plagiarist. 4. Accuracy and Validity: Believe it or not, I make mistakes from time to time but I strive to make facts and information as accurate as possible. In addition, this blog is a work in progress. This means that what may seem valid today (content, sources, links) changes over time and may not be valid two days, two weeks or two eons from today. 5. Photographs: Any photograph which is not otherwise attributed to another source, is owned and has been scanned by me. If you wish to use the photograph, please ask permission. And ask nicely. 6. Comments: I am not responsible for any comments made by others who visit this blog. I will exercise my right to moderate and edit comments which I deem to be offensive, childish or just plain dumb as a box of hair. 7. Liability: As a reader, you will not hold me liable for libel (say that three times fast) for what I say or display. The content of this blog is the opinion of me, not intended to malign any religion, ethnic group, club, organization, company, or individual. And don't get all PC on me - I don't take myself seriously and you run the risk of me not taking you seriously. In addition, there is no intention to do harm by my posting content in this blog. What I write on this blog is not to be taken as fact nor absolute. If people use my advice, tips, techniques, and recommendations, and are injured, I am not to be held responsible. Remember what your mother said - "If Johnny told you to jump off the Brooklyn Bridge, would you do it?"